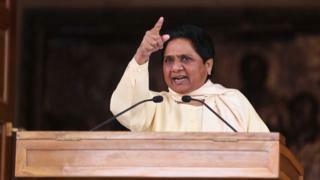 One of India's best-known politicians, Mayawati, has shocked the country by announcing she will not run in the upcoming general election. She said she would instead "concentrate on an alliance" formed to counter the influence of the ruling BJP. Ms Mayawati is an icon for India's low-caste Dalits and a four-time chief minister of Uttar Pradesh, which sends the most number of MPs to parliament. The elections will be held in phases from 11 April, with results on 23 May. Regional parties like Ms Mayawati's Bahujan Samaj Party (BSP) are expected to be the kingmakers, particularly if there is no clear majority for any one party. At a press conference on Wednesday, Ms Mayawati said she would not stand for a seat in the lower house of parliament, before adding that she can "win a Lok Sabha election whenever I want". "Keeping in mind the current political situation, I have decided not to contest Lok Sabha polls," she told reporters. "I can't let the alliance suffer at any cost. Winning more seats is more important than my victory." Ms Mayawati's BSP has allied itself with the Samajwadi Party (SP), a regional arch-rival ahead of the polls. They are part of a wider national alliance against the ruling BJP. Ajoy Bose, a journalist who has authored a biography on Ms Mayawati, described the move as "odd", but suggested it might be an attempt to show herself as being above "petty party politics". "She's trying to rebuild her image," he told the BBC. "This move shows her to be someone who is above the fray; someone who is supportive of the bigger fight and lends her support to the regional party movement." Ms Mayawati has had a chequered political career. She quickly rose to prominence and, at just 39, became the chief minister of Uttar Pradesh in 1995. She was the youngest Indian politician to hold the post. In September 2012, leaked US diplomatic cables said she had sent an empty private jet to fetch a pair of sandals from Mumbai - a charge she denied. Critics accuse her of wasting public money given that the state is among India's poorest with a high crime rate and low development indices: nearly a dozen statues of her and more than 75 stone elephants, her party's symbol, were constructed in Uttar Pradesh during her time in power. She lost the 2012 state election to the SP. And yet, Ms Mayawati - who is affectionately called "behenji", or "sister", by her supporters - enjoys the loyalty of millions of India's poor and oppressed Dalits (formerly untouchables). Her support largely stems from this group, although she has forged alliances with upper-caste Hindus to broaden her base. Ms Mayawati was elected to India's upper house or Rajya Sabha in 2012, but quit her post in 2017 amid caste violence in Uttar Pradesh's Sahranpur district.